The Molinari Quartet, now in its fourth year, has initiated a unique combination of art and music—a veritable palette of sound. The quartet rehearses in the studio of Montreal avant-garde painter Guido Molinari, where first-time visitors are assailed by the artist’s powerful use of colour and meticulous precision of line. Artist and musicians have formed a special bond, and in many ways the osmosis between Molinari and the quartet that bears his name seems complete. One can find startling parallels between the painter’s canvases and the quartet’s playing—rich invention of colour (artistic or musical), mutual respect and understanding, and mastery of the most complex forms in both media. Above all, there is a shared enthusiasm. 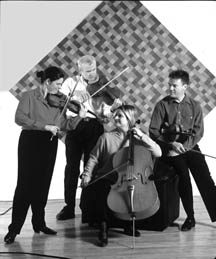 The quartet was founded in 1997 by artistic director Olga Ranzenhofer with the help of Guido Molinari. It is devoted to the repertoire of the twentieth and twenty-first centuries, although one more readily associates it with R. Murray Schafer’s works, particularly his seven string quartets. As Ranzenhofer explains, "Contemporary music is only part of our mandate, which is much greater. The quartet repertoire is immense, with an inexhaustible supply of masterpieces. We simply decided to pick a starting point. There was a blossoming of national schools at the beginning of the last century, and for any given date in the musical history of that century, one can find an extraordinary range of works of different tonal colours, styles, and artistic qualities. If you compare the music of Webern in 1910 to what was being done elsewhere, you might think that fifty years separated them." The quartet has some forty works in its repertoire (ten new works per season), which allows for planning concert programs adapted to host sites or organizations. Murray Schafer’s quartets occupy a privileged place in the repertoire. The performance of all seven in concert in December 1999 (also recorded on CD) was enthusiastically received by contemporary music lovers. From the quartet’s inception, Ranzenhofer announced the ambitious project of doing all Schafer’s works. "Everyone can enjoy listening to Schafer’s music," she says. "It’s very human and touches the heart. It doesn’t leave people indifferent. You find some extraordinarily innovative things in it, as well as parts that are far more accessible. Alongside the almost infinite number of soaring melodies are passages of unbelievable rhythmic intensity." Schafer is currently working on the final stages of his eighth quartet, to be premiered at this summer’s newly resuscitated Stratford Music Festival. The Quebec premiere will take place a few days later at the Orford Arts Centre. The quartet’s non-traditional program is aimed at drawing larger audiences, and this is why the much-appreciated formula of "Dialogues" (art and music) has been developed with Molinari (it moved this year to Montreal’s historic Bon Pasteur Chapel to accommodate a bigger audience). One of the program’s aims is to give the audience another dimension of appreciation. Music lovers are often put off by the bubbling up of ideas in contemporary music. Like children who don’t understand something right away, they balk at not finding a recognizable theme and often give up, declaring that they don’t like this kind of music. Ranzenhofer feels it’s important to break through the shell of preconceived ideas. "We must try to free people’s imaginations, allow them to feel atmosphere and colour," she says. Colour—that word again. Ranzenhofer refers to it continually, as others speak of phrasing or style. From the time of her first meeting with Molinari, she was struck by the crossover vocabulary of their discussions. "Guido began talking about his canvases in musical terms," she remembers. "He spoke of rhythm, harmony, timbre, and melodic lines, while I found myself talking of music in terms of colour, texture, and effects." Since then there has been total empathy among the members of the quartet and their "godfather." His paintings appear in concerts as a visual element that complements but never overwhelms the music. In rehearsal, the music fills the painter’s workplace—an old bank which is a little cold in atmosphere, but is given life by his canvases. As much as possible, says Ranzenhofer, the quartet tries to have Molinari’s works displayed when it is hosted outside Montreal (as this summer at the Stratford and Orford festivals). The four musicians would like to perform together full-time—as a quartet in residence at a university, for example, a formula used by many major quartets. For the moment, violinist Johannes Jansonius and violist David Quinn have to juggle with their demanding schedules as members of the Montreal Symphony Orchestra. Cellist Julie Trudeau performs regularly as a soloist, often with dancers. Olga Ranzenhofer must also find time for her various commitments, as well as her work as solo violinist with the Ensemble de la Société de Musique Contemporaine du Québec and her duties as the quartet’s artistic and administrative director. Despite their hectic schedules, quartet members meet for eight or nine hours each week, and each day for two weeks before a concert, polishing every minute detail. Ranzenhofer considers the quartet the ideal ensemble form. It constitutes an instrument with an immense range of sound and infinite possibilities for expression. Music has been her world since early childhood, and she remembers fondly the weekly meetings of her father’s amateur quartet (he played second violin). She would sit beside him, entrusted with the delicate task of turning the pages for him. She now shares this sense of intimacy with the other members of the Molinari Quartet in what she calls "a musical marriage." Criticism is constructive and must never be misinterpreted. A comment on the accuracy of rhythm, the use of nuance, or worse, tone (certainly the most sensitive point with all string players) is always tactfully expressed. The musicians’ goal is to explore the work and do their best for the composer. After four years together, the musicians appear to have achieved a perfect osmosis, becoming friends rather than just colleagues. This unity makes for magical moments in concert, "a unique aesthetic experience," they say. A single glance is enough to change the direction of the work without the audience being aware of it—often a decrease in tempo, a pianissimo simultaneously felt by all four, or a tone colour that can illuminate the listener’s imagination long after the last sound has faded away. Don’t miss the Molinari Quartet’s forthcoming performance on April 19 with the Montreal Symphony Orchestra in Ana Sokolovic’s "Concerto for Quartet and Orchestra." The ensemble will also be performing "Dialogues à la Chapelle" in Montreal’s Bon Pasteur Chapel on Saturday, June 2, and can be heard in concert in the "Twenty Plus" series at McGill University’s Redpath Hall on June 4, as well as in several summer festivals.